The Tiffany Mountain area is a high-elevation mature forest, mostly over 6,000 feet, which is easily accessible by motor vehicle during the summer months. 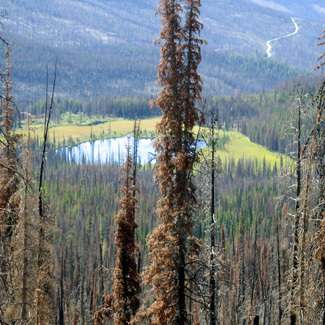 This Okanogan Highlands forest community consists of such trees as subalpine fir, subalpine larch, whitebark pine, Engelmann spruce, and lodgepole pine. Much of the forest is dominated by mature Engelmann spruce, a very stately tree. The average annual precipitation is between 20 and 30 inches, most of which falls as snow. Most of the year the roads are buried under snow, and the area is accessible only on foot or with snowmobile. By late June, the roads are usually free of snow, and typically remain snow-free through the end of September. This area is notable for two relatively unique resident birds that are difficult to find in Washington: the Boreal Owl and Boreal Chickadee. The chickadee can be relatively common, while the highly nocturnal owl is most easily heard, but not usually seen. It can be heard along the entire length of Forest Road (FR) 39, even at the campgrounds - indeed, on one September outing, at least eight Boreal Owls were heard along this road. Seeing this elusive owl is another story, but with persistence and a bit of luck it can be found. Other interesting high-elevation species in the area include Spruce Grouse, American Three-toed Woodpecker, Clark's Nutcracker, Mountain Chickadee, Pine Grosbeak, and White-winged and Red Crossbills. Tiffany Mountain can be reached by at least three main routes: 1) from Winthrop via the Eastside Chewack Road; 2) from the town of Conconully via the West Fork Road; and 3) from the town of Loomis via the Toats Coulee Road. Both roads from Winthrop and Concunully join with FR-37, which then joins with FR-39. The Toats Coulee Road becomes FR-39 at its northern end. All of these roads are gravel but are well maintained and can be driven by any type of vehicle. Take a detailed, up-to-date map, as there are numerous other roads in the area. From FR-39, you can reach numerous hiking trails. Most notable perhaps is the Freezeout Ridge trail, which leads to the top of Tiffany Mountain, taking you through forested habitat and then rising above tree line into alpine habitat. There are two campgrounds near FR 39 - Tiffany Spring campground near Tiffany Mountain and Long Swamp Campground, roughly twenty miles north of Tiffany Spring Campground. A trail leads from the Tiffany Spring campground to Tiffany Lake and beyond. Three small but interesting lakes - Roger, Tiffany, and Little Tiffany - are near Tiffany Mountain.